BluePencil Ultd. is the online portfolio of Steve Tansley. Steve is an accomplished illustrator and designer. Steve's work has celebrated many honors including two Prisma Awards, Phoenix Addy Award, and a Summit Creative Award for Excellence in Design. He is a member of the AIGA and is the co-creator of Goodfences, a hilarious web comic. Steve was recently the Director of Creative at Rhino Internet solving branding and usability problems. Today he is a creator, director and designer by trade. He lives in Scottsdale with his wife, seven kids and rhodesian ridgebak named Sooki. June kicks off Dc Comics month of Superman. 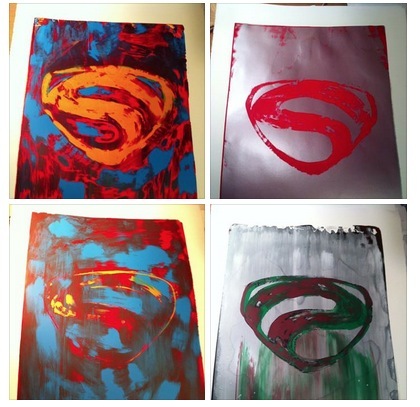 To celebrate I created these one-of-a-kind monoprints. They are a uniq representation of the all-to-familiar icon. We are all looking forward to the new film release. If you want to know more about these prints or how you can get one contact me by email or phone. Enjoy.